Any inclusive study of post-Second World War music in Great Britain must take into account a number of trajectories. These include, but are not limited to, the phenomenon of Benjamin Britten, ‘conservatives’ like Robert Simpson and Edmund Rubbra, ‘traditionalists’ such as Kenneth Leighton and Alun Hoddinott, serialism, minimalism, light music, ‘pop’, progressive rock and the so-called avant-garde or modernist music. The present book is mainly concerned with the last of these styles, nevertheless, the boundaries are fluid. David Bedford, for example, can sit in more than one camp. Any debate has to recognise artistic development over time. What critic in the 1960s would have imagined that Peter Maxwell Davies would become a major symphonist or that John Tavener had moved into the realms of ‘diatonic tonalism’? The main time-frame explored in British Musical Modernism is from the ‘famous’ 9 January 1956 concert presented at the Institute of Contemporary Arts in London by the Manchester Group (Maxwell Davies, Birtwistle and Goehr) to the mid-nineteen-seventies. The era is well-summed up in Alex Ross’s The Rest is Noise (2009): ‘Music exploded into a pandemonium of revolutions, counterrevolutions, theories, polemics, alliances and party splits. The language of modern music was reinvented on an almost yearly basis.’ Ross notes twelve-tone works, total serialism, chance music, ‘neo-dada happenings’ and collages as some of the contemporary techniques used. British Musical Modernism ‘traverses a generation of composers in [a] sequence of focused interpretive readings of a selection of their key works.’ Philip Rupprecht declares that the chapters are more akin to pen and ink drawings rather than a ‘full-dress canvas in oils’. In reality, he is being modest. Into this progression of music, the author introduces detailed studies of eleven composers and several of their compositions. Some of these have become well-known to enthusiasts of this era: others have fallen by the wayside. None has become popular in the wider classical music world: they are rarely heard in the concert hall or on radio. The discussions of individual works in this book are thorough and represent a major scholarly analysis that has not been attempted before. The author recognises that he has ‘[traced] one path through the British modernist scene after 1956’. There are other journeys that can — and ought to — be developed through these two vibrant decades. Rupprecht argues that many British composers lagged Continental developments in applying progressive procedures. Listeners and concert-goers were given less opportunities to get to grips with modernism than their European counterparts. On the other hand, it is important to recall Jennifer Doctor’s contention (The BBC and Ultra-modern Music 1922-36, 1999) that the schools of Webern and Schoenberg were better represented in Britain during the middle part of the twentieth century than had been hitherto suggested. Musically, the period considered by British Musical Modernism has suffered relative neglect in academic and popular deliberation. One important textbook, British Music Now, edited by Lewis Foreman (1975) covered this era, but clearly was written close to the events. It still forms a good introduction to the subject. The major historical volumes issued by Blackwell and Oxford University Press outline the important players and artistic mores in more or less detail. Grove provides further information on the composers and their musical styles. Other information can be gleaned from the academic press, theses and dissertations. Much has been written about the Manchester Group. Maxwell Davies has had the greatest attention: there are bibliographies, a source book, surveys of music and biographies. As former Master of the Queen’s Music he has become a popular figure with many listeners. Harrison Birtwistle has a few books dedicated to his music, including Jonathan Cross’s recent Harrison Birtwistle: Man, Mind, Music (2014) and a collection of Studies (2015). Relatively little has been written about Alexander Goehr. There is the hard to find Sing Ariel: Essays and Thoughts for Alexander Goehr's Seventieth Birthday which was issued in 2003, and the thirty-five year old book by Bayan Northcott, The Music of Alexander Goehr. A vital text for historians of the Manchester Group and their time is Finding the Key: Selected Writings of Alexander Goehr which was published by Faber & Faber in 1998. Many of the other contemporaries discussed by Philip Rupprecht have no formal studies in print. Especially lacking are definitive biographies of David Bedford, Gordon Crosse and Thea Musgrave. British Musical Modernism is a densely written book, with each chapter being largely descriptive of a particular set of composers or specific style. There is deliberately no attempt at following their careers beyond the mid-seventies. The musical analyses range from Elisabeth Lutyens’ serial ‘Wittgenstein’ Motet (1953) to the Tim Souster’s ‘crossover’ World Music (1974/80) which ‘encapsulates the pop/avant-garde ‘collision’ he had sensed years before’. Chapters include introductory material defining British modernism, which is a decidedly tricky business. ‘Post-War motifs’ surveys the influence of the ‘internationalist ideal’ on British composers. Rupprecht suggests that an iconic event was the first performance of Iain Hamilton’s Sinfonia for double orchestra at the 1959 Edinburgh Festival. This generated reviews representing it as ‘a flash point of chauvinist tensions between nationalist and internationalist music’. It was written to commemorate the bi-centenary of Robert Burns’ birth. Something ‘kailyard’ akin to his earlier popular Scottish Dances (1956) was widely anticipated, but Hamilton turned in an avant-garde piece that caused consternation. William Glock’s presence as controller of the BBC and his enthusiasm for ‘modernist’ music is examined in considerable detail. The Manchester Group (or School) is featured in Chapter 3. After presenting concerts of music in Manchester and London in the mid-1950s, Maxwell Davies, Birtwistle and Goehr went on to become leading avant-garde composers in the United Kingdom. Their attempts to synthesise the serial-structuralist music emerging from the Continent, especially from Darmstadt, with more traditional British elements were largely successful, if not immediately popular. Their further development in the nineteen-sixties is observed in Chapter 5. Opinion has often focused on the break from tradition that they created. However, Rupprecht stands the argument on its head and examines the use made by these composers of English poetry and texts, the rediscovery of Elizabethan models such as the First Taverner Fantasia by Maxwell Davies and folk-traditions like Punch and Judy developed into a ‘stark’ opera by Birtwistle and the same composer’s ‘Down by the Greenwood Side’ utilising an old English ballad. Chapter 4 examines an important cluster of ‘modernist’ composers who were active during the height of the Manchester Group. It analyses music by Nicolas Maw, Richard Rodney Bennett, Thea Musgrave and Gordon Crosse, each of whom were ‘responding to the post-Webern moment in 1950s modernism.’ The sub-section, ‘In the Serial Workshop: Elegy, op.1’ which investigates Gordon Crosse’s early piece is an excellent piece of scholarship. He is an important composer who has been largely ignored by musical historians. Richard Rodney Bennett’s music is given an overview as well as a detailed consideration of his Symphony No.1 (1965). I was particularly interested by Chapter 7 – ‘Vernaculars: Bedford and Souster as pop musicians’. 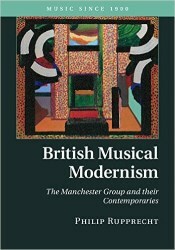 Rupprecht investigates how both men progressed from being ‘well-versed in the British modernist scene’ and having had ‘formal institutional training’ towards a rapprochement with ‘pop, rock, American minimalism, electronic sounds and non-European music.’ David Bedford is considered in over 30 pages of text, making it one of the most extensive examinations of his music available. Works examined are Whitefield Music (1967), Two Poems for Chorus (1963) (called Two Choruses in the text), the Tentacles of the Dark Nebula (1968/9) and one of my favourite pieces of avant-garde music, Twelve Hours of Sunset (1974). This last piece pushes towards a perfect fusion of the ‘vernacular’ and the ‘modernist’ approach to composition. Fascinatingly, this chapter includes a comprehensive study of Malcolm Arnold’s Fourth Symphony with its pop/Caribbean inspired ‘big’ tune and Peter Maxwell Davies’ St. Thomas Wake with the famous ‘foxtrot’. The web-address of an extensive discography (.pdf) of compositions cited in the text is included. It is a valuable document for both the listener and historian of this period. The book has an impressive bibliography which provides a huge compendium of sources. It ranges from contemporary criticism of music to essays and articles by the composers and instrumentalists themselves, to modern readings of this music. It is wide-ranging and includes the theoretical writings of Pierre Boulez and Michael Nyman through to Bernard Benoliel’s essay on ‘Mike Oldfield – with and without Bedford’. There are references to current politics, volumes of poetry and interviews with artists. Assessments of music as diverse as The Beatles, Soft Machine, Cornelius Cardew and Elisabeth Lutyens are cited. It would have been useful to have subdivided the bibliography into sections – reviews, books, journal articles, websites and academic theses and dissertations. There is a wide-ranging index providing references to all the composers, performers and their musical works. British Musical Modernism is printed on high-quality paper. I found that the font was a little small for my eyes, especially with the footnotes. There are a number of photographs (or figures) including images of musicians and holographs of scores. Throughout the text there are many musical examples in both full-score and piano reduction. These are clear and readable. It was a wise decision to use footnotes rather than endnotes: for an academic book it is not over-burdened with them. Philip Rupprecht’s webpage intimates that ‘… he specializes in music of the twentieth and twenty-first centuries. His recent writings engage concepts of narrative in opera, the circulation of stereotypes in the formation of national traditions in music, and agency effects in instrumental music. He is the author of Britten's Musical Language (Cambridge, 2002). He co-edited Tonality 1900-1950: Concept and Practice (2012); and edited Rethinking Britten (2013).’ He is currently Associate Professor (Music Theory and Musicology)’ at Duke University. I implied above that this is primarily a scholarly book. The majority of copies sold will end up in the libraries of universities and music colleges. This is as it should be. However, any private researcher who is interested in the British avant-garde will also discover that this book is essential. There are three reasons for its success. Firstly, a huge arc of musical history is investigated. It explores beyond the ‘Manchester Group,’ into areas which have not been adequately studied. Secondly, the extensive bibliography is an ideal place to commence any in-depth enquiry into this generation of composers. Thirdly, the musical works analysed may be challenging, but they are all important and significant contributions to the period. Philip Rupprecht’s clever approach to this investigation combines technical details with reception history which makes this book an impressive gateway into this complex, sometimes off-putting, but always thought-provoking musical world. Rupprecht is correct when he admits that British Musical Modernism concentrates on a ‘small gathering of scores’ and that the book cannot ‘approach comprehensive coverage’. He suggests that any overview must either be synoptic or ‘a shelf of book-length studies’. This present volume is an essential survey of a generation of British music that has been largely ignored. What Rupprecht has begun, will, I hope, be continued by others. I believe that this book sets the baseline for all research into the ‘avant-garde’ of the British post-Second World War era.